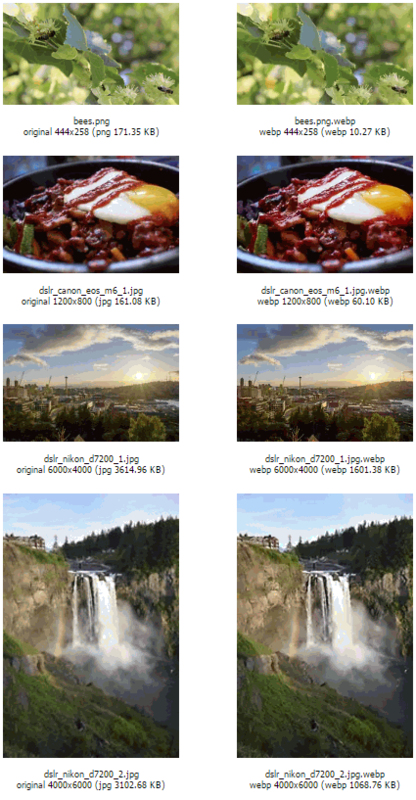 This page was created to demonstrate how JPG/PNG images converted to WebP format via optimise-images.sh batch image converter tool can be served conditionally via Nginx web server to web browsers that support WebP image formats. See forum thread for the WebP conversion details. The optimise-images.sh batch conversion and resizer tool now also has a new option - optimise-webp-nginx mode which allows the below Nginx config syntax to be auto generated by your defined web directory path containing your JPG/PNG and WebP images as well as can auto generate a static html gallery comparing side by side your optimised resized JPG/PNG with your WebP converted image. WebP format images are usually much smaller in size than JPG/PNG files (upto 80% smaller) allowing web pages to load faster and are only supported by some web browsers like Google Chrome and Opera. So for non supported browsers like Microsoft Internet Explorer/Edge, Mozilla Firefox and Safari, we need to fallback to the standard JPG or PNG format based images. Below guide is for Nginx users who are not using Nginx ngx_pagespeed module which has filters which allow on the fly auto conversion of JPG, PNG and GIF files to WebP format for just web browsers that support it. You can read up on benefits of ngx_pagespeed module here. Step 3. Within your Nginx vhost's location context i.e. /webp, you can add the following - remove the noindex/nofollow header if you want the page to directory /webp to be indexed by search engines and remove autoindex if you don't want directory contents to be viewable without a index page. 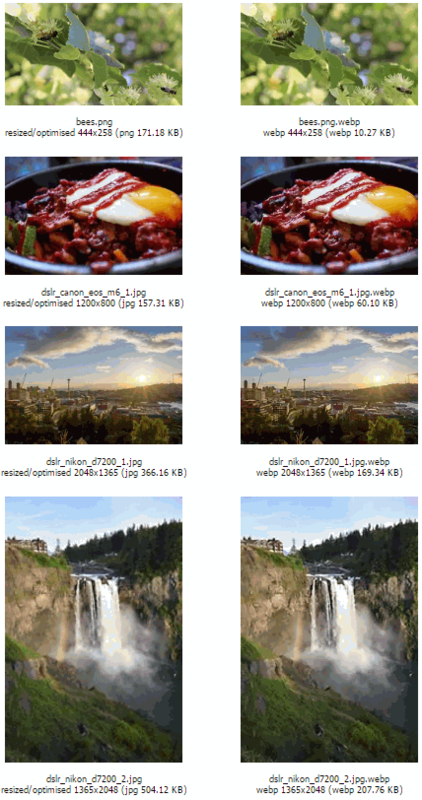 For Nginx ngx_pagespeed users, you may have enabled JPG/PNG auto conversion to WebP filter which may affect the below setup, so you would need to uncomment the pagespeed off (for ngx_pagespeed 1.12.34.3-stable and below) or pagespeed unplugged (for ngx_pagespeed 1.13.35.1-beta and above versions) by removing the front hash to disable ngx_pagespeed filter within /webp directory. 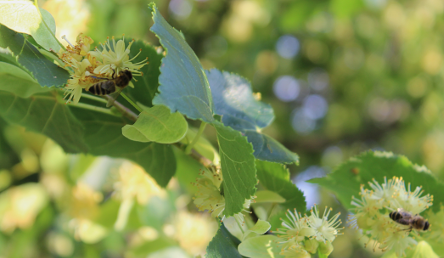 Below is a demo of PNG embedded image, bees.png which has corresponding bees.png.webp format image in same directory. If this page is viewed in a web browser that supports WebP and is served from a web server like Nginx with above configuration, you will see the image mime type reported as WebP instead of PNG while the image extension remains as displaying bees.png. Otherwise, if served from a web server without such a configuration, you will see the original bees.png image being served instead with mime type reported as PNG. 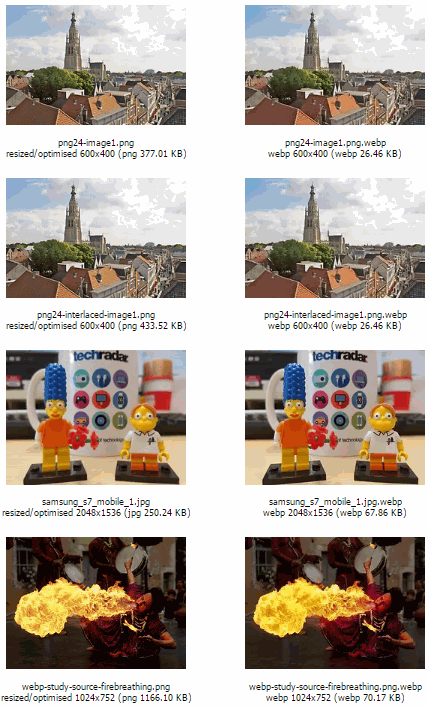 Below is example of optimise-images.sh batch conversion and resizer tool's new option - optimise-webp-nginx mode's auto generated static html gallery comparing your optimised and resized JPG/PNG images side by side with WebP converted copy.